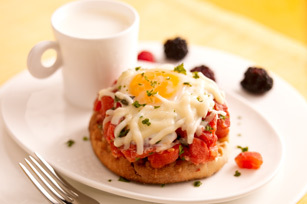 Try these Quick 'n Easy Brunch Eggs with cheese and tomatoes! These delicious Quick 'n Easy Brunch Eggs will take center stage and wow your guests. Combine tomatoes and basil in 13x9-inch baking dish sprayed with cooking spray. Use back of spoon to make 8 wells in tomato mixture. Slip cracked egg into each well. Bake 25 min. or until egg whites are set and yolks are cooked to desired doneness. Top with cheese; bake 5 min. or until melted. Serve over muffin halves; sprinkle with parsley.